I am planning to review Marvel Heroes, a Marvel-ized Diablo style MMO in the near future. I do not, however, plan to come within a country mile of it’s DLC/expansion packs. Why? Let me explain. Are you effing kidding me?! 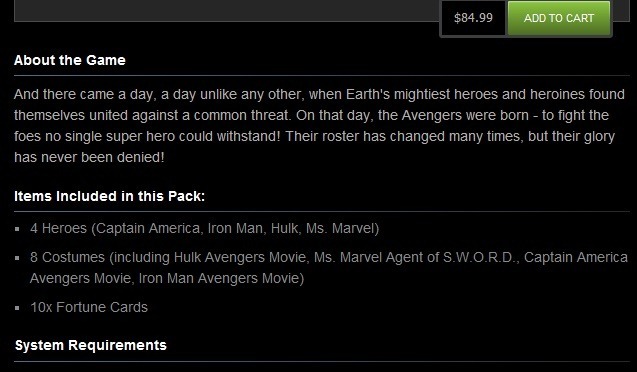 Marvel Heroes is Free to Play, and like any such game they offer “micro transactions” to sustain itself. Apparently, their ‘”micro” is everyone else’s “macro.” Look at this. What the freaking hell is up with those prices? $250 to buy it all? I can only think of one game that has ever justified a $100-plus price tag at launch, and that game (Steel Battalion) came with a unique, huge controller that really made the game what it was. $250 for booster packs? Hell no. Let’s see what you get for this money. You HAVE to be kidding me. Four heroes, eight costumes and “10x Fortune Cards?” Those cards had damn well better be worth $80, because the rest of that pack isn’t worth any more than $5, tops. I still plan to review this game, but this DLC needed singled out. I would call this is a joke, but it’s not funny. Do not feed the vultures, folks.